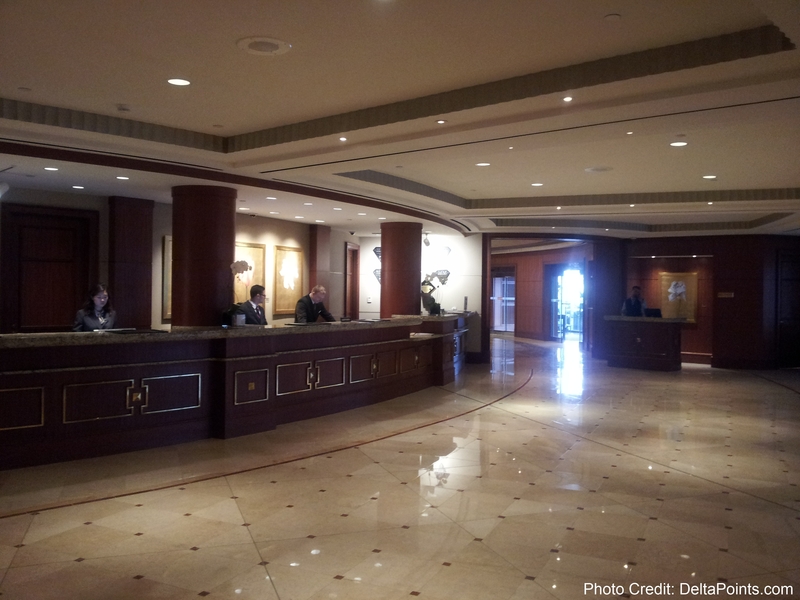 Trip report part two – Intercontinental Hotel Cleveland / Cleveland Clinic – I left a day early! I love Intercontinental hotels. 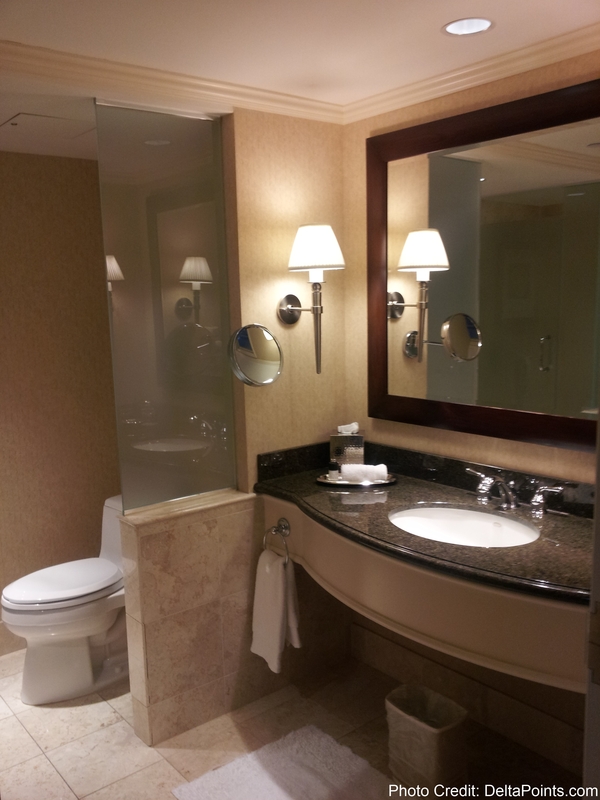 My trip to the Intercontinental Hotel in ORD was just about as perfect as possible. I had booked 3 rooms, and had my primary room upgraded. Not just upgraded, but to a room that overlooked the runway at ORD. (these people just know me so well and I love them too)! I just can not wait to go back again. Then there was this trip. I have never checked out early and said; “I don’t care, flush the points, I just want out of this hotel!” Yep, that bad. And this is a hotel that is physically attached to the Cleveland Clinic medical hospital to make sure guests, as well as their families, who are there for treatment can do so in nice surroundings. Sounds great in theory. Let’s start with check-in. “Marion” greeted me as a PC member. NOT a PLATINUM PC member, just a member. Way to get on my good side from the first moment in the door. Next, I ask, as a PC PLATINUM member, is there any chance for an upgrade? I pause here for a moment for those who do not know. IHG is a hotel group with a split personality. Intercontinental has their own program called Ambassador you must pay or stay to get. If you stay a ton, or are Ben or Gary, you are invited to become a Royal Ambassador and they love you like a cousin. They do NOT have to honor PC status, but I have found they often do for at least one room. This is even the case for points nights that again do NOT need to be honored but most of the time are. So now back to the story. So upgrade? “Marion” gives me a look, pause, another look, then says, “We have you in a King room 10th floor.” (No kidding! I knew that as that is what I booked, Marion). 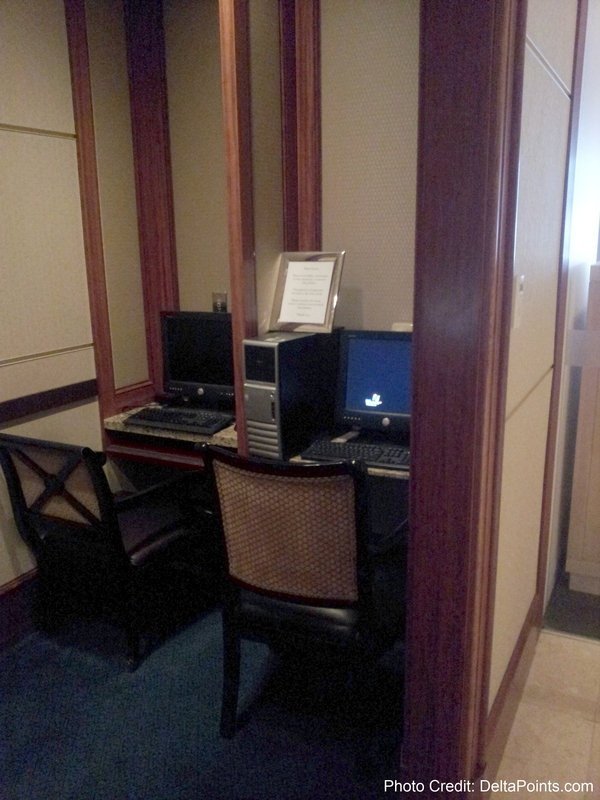 I again ask, so no chance for any kind of suite upgrade? Blank stare and nothing said at all, he just hands me keys and a map for parking off-site if you don’t want the $24/day valet parking. Up to the room. The room was a standard room. The temp was fine. The room was clean. The bathroom was VERY nice size. But the desk and chair area needed work. Check out the chair! I love that “pinchy” feeling while I work, don’t you? 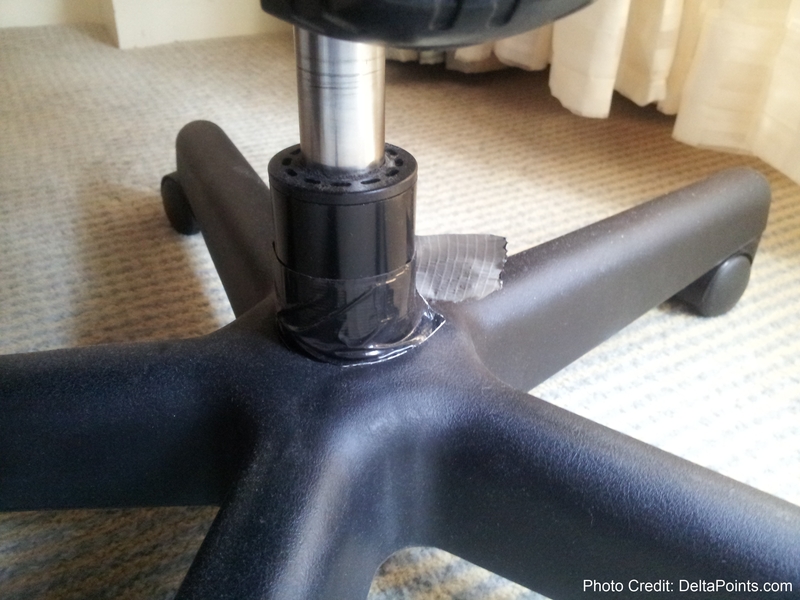 And black duct tape works everywhere! So I tweeted to IHG to ask them if they could better the situation. Silence followed in twitter land; ah well. The bed was comfortable and for a 5k point breaks night this was OK for just a 3 day stay. Then night two of my three night stay. At about 12:15AM the door across from me began to slam again and again. I looked out to see people, mostly loud and scantily dressed girls, streaming into the room. and some guy in “jammies” put his head out and said they would keep it down. 5 minutes later, noise back and at 2:AM the door slams repeatedly as everyone must have been done at party central across the hall from my room (thanks all in room #1023)! 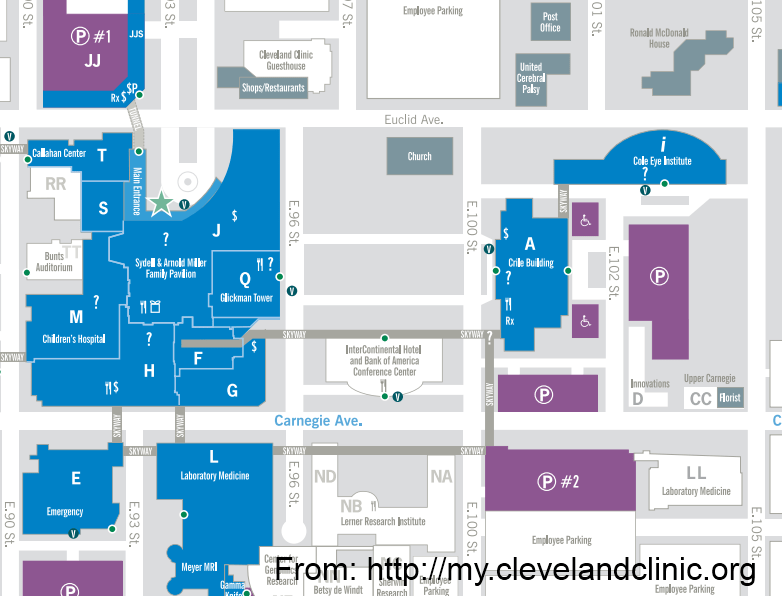 Now again, this is a hotel physically attached to the Cleveland Clinic medical hospital! In the morning I told Lisa, “Pack up, we are done here! Exit protocol! I don’t care what they do with the rest of the points for the last night“! 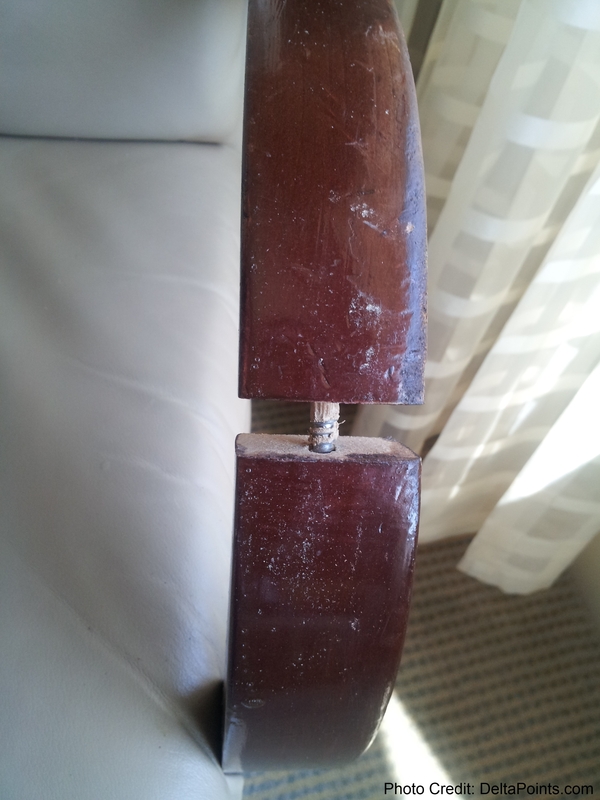 Thank you for contacting IHG Care regarding the InterContinental Cleveland. As a Priority Club Platinum member you are one of our most important guests, and we greatly appreciate you taking the time to bring this matter to our attention. 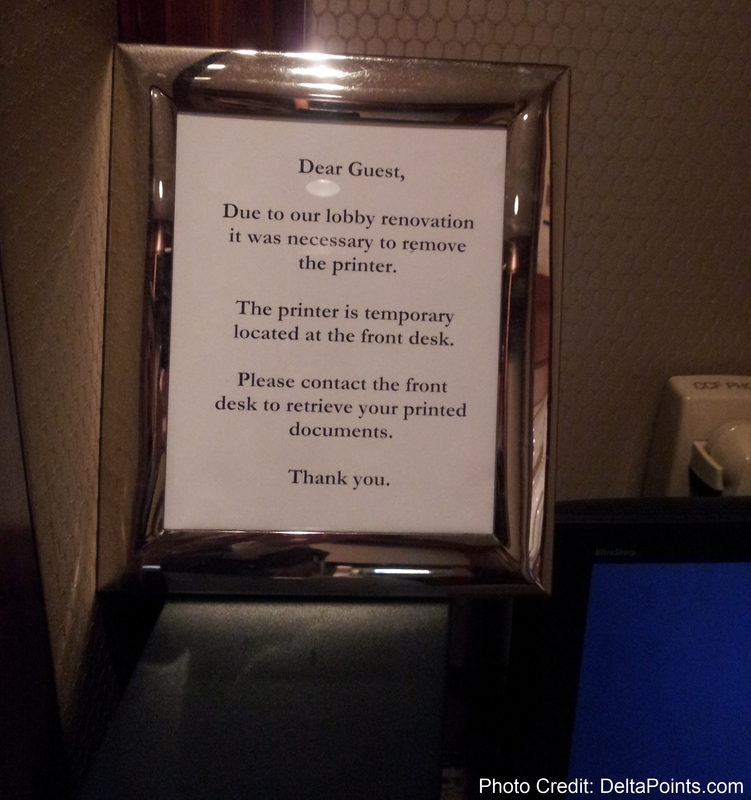 We are also very sorry for any inconvenience the room conditions and behavior of other guests may have caused you. It is IHG’s goal to consistently provide superior service and accommodations and your comments are very important to us. The feedback we receive from our valued guests, like you, enables us to target problem areas, and take the necessary actions to ensure similar situations can be avoided in the future. We appreciate the candid feedback we receive and welcome any opportunity to improve. I have forwarded your comments to the General Manager and ownership of this hotel, and I am confident they will take the necessary steps to continue to improve their services. In addition, in an effort to retain your patronage and demonstrate our concern in this matter, I have issued 10,000 points to your account, on their behalf. These points will be converted to your current earning preference with Priority Club Rewards and should appear in your account within the next 7-10 business days. Once again, we appreciate you taking the time to share your comments with us. We know you have many choices when it comes to lodging and we hope you will continue to choose IHG for your future travel needs. I appreciate the email and the acknowledgment from IHG. 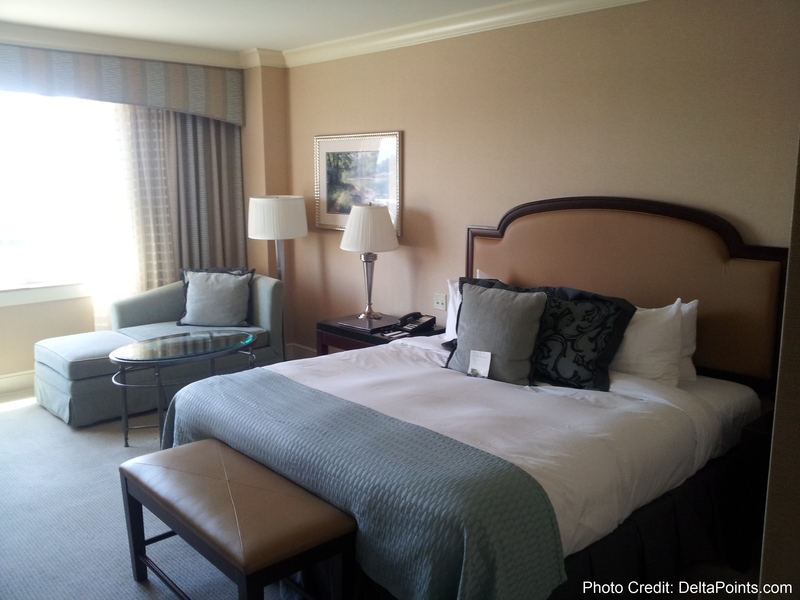 @IHGPLC can learn a thing or two about social media from @SPG! Also, while we were doing our final packing, I got a call from someone at the front desk. It may have been because I mentioned at checkout I would be sharing a review of the hotel on the blog, who knows! I was extended a refund for my points for the non-sleep night and for the night I was not going to stay. I was promised if I would return the next stay would be different (promise 2x more times)! ← A passenger boards DELTA AIR LINES flight 5106 yesterday with another person’s boarding pass! What a service nightmare. I think I’ll be avoiding that location! I just landed Platinum Royal Ambassador and will be checking out the Buenos Aires Intercontinental. Too bad their 5k Point Break just ended! For me the refund of the points and the 10k from IHG Care would not have been sufficient recompense. 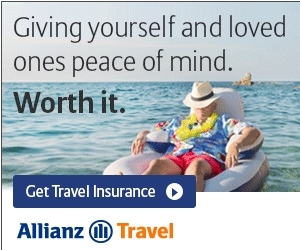 The lost of the time, effort and expense when you take a trip, the loss of a pleasurable travel experience with family is not reimbursed with mere points. The hotel chain should have extended you a free top grade hotel reservation to be chosen by you within the following year. What happened is totally unexceptable. Wow, I was thinking about staying here when I saw it on the list. Glad I skipped it. Maybe you should of said to Marion…”Maybe you don’t know who I am, I’m a PC Platinum member” Like they would have cared less. I hate bad service. My family and I recently spent two weeks at the Cleveland Clinic. The attached ICH had poor online reviews (as did other hotels near the clinic) and high prices, so we opted stay at a Marriott Residence and drive a 15 minute commute each day. The Residence Inn had a two king-bed, two full-bath suite for half of what one room would have cost at the ICH. Sounds like we made the right choice. BTW, the Cleveland Clinic itself is everything the ICH should be. It’s like visiting a medical EPCOT.